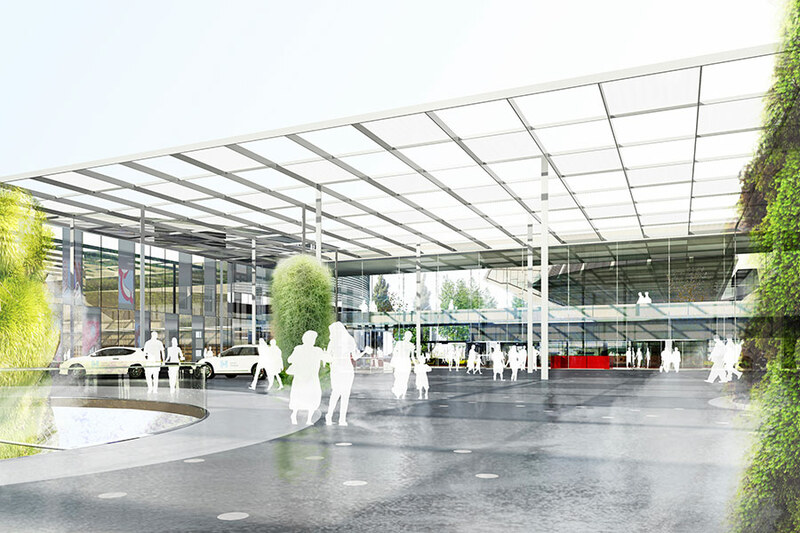 Herlev Hospital in Denmark by Henning Larsen. In the early part of the 20th century, design for illness was a grim affair. Driven by the dread of infectious disease—especially tuberculosis and other contagions found in dense, dank cities—doctors and architects turned to the transparent, hygienic values associated with modernism. Cures included moving patients to specialized, isolated environments with unornamented white or glass walls and ample sunlight that were elevated on pilotis and off the unsanitary earth. Today, we talk about design for health, not illness. Rather than segregate the ill from the well, design strategies now aim to make environments conducive to healthier habits. Contemporary healthcare institutions—recognizing that waiting until acute diseases need high-tech attention is an inefficient form of care—are reaching further into public space and emphasizing prevention, nutrition, primary care, and triage. This more porous relationship between healthcare and communities comes with design implications at the civic, neighborhood, and residential scale. It even affects the personal level, as home care, smartphone health-monitoring apps like the FitBit, and telemedicine reflect and amplify two intertwined trends: the medicalization of everyday life and the deinstitutionalization of medicine. In 2010, New York City’s Active Design Guidelines codified what many architects, planners, and public health officials already knew: that built environments could exert pathogenic effects—circulation patterns encouraging sedentariness and elevator overuse, poor lighting and air quality, food deserts, and streets subordinating self-powered movement to motorism. The Active Design Guidelines, however, recognized the need for a different approach and set forth a design philosophy in which existing environments could be redesigned as salutogenic, incorporating exercise and healthier nutrition into spaces and daily routines. From low-hanging fruit like stair prompts and wayfinding signage to the more complex redesign of streetscapes, office buildings, affordable-housing complexes, and entire communities, Active Design has become a globally recognized movement over the ten years of its Fit City/Fit Nation/Fit World conference series, yielding seven supplements to the original Guidelines and assuming institutional form with the 2013 founding of the Center for Active Design. Some healthcare organizations have long promoted community health alongside hospital-centered interventions: Kaiser Permanente, for example, launched the first of its hospital-based farmers’ markets in Oakland in 2003, anticipating public programs like the New York City Department of Health’s Stellar Farmers’ Markets and Health Bucks coupon program. Civic-scale changes, from smoking bans to pedestrian-friendly street designs such as the wide medians and car-free plazas that began appearing under Transportation Commissioner Janette Sadik-Khan, transform public spaces so that healthy choices become intuitive norms, not exceptions. Ogbu’s ReFresh project—which opened in New Orleans in October and is spearheaded by Broad Community Connections—is an adaptive reuse of a long-defunct grocery store along a major mid-city thoroughfare. A Whole Foods serves as the anchor tenant for the multifunctional health hub, along with eight other partners onsite, including a community teaching farm, a Boystown center, the nonprofit cafe and youth training program Liberty’s Kitchen, and Tulane University’s Goldring Center for Culinary Medicine. 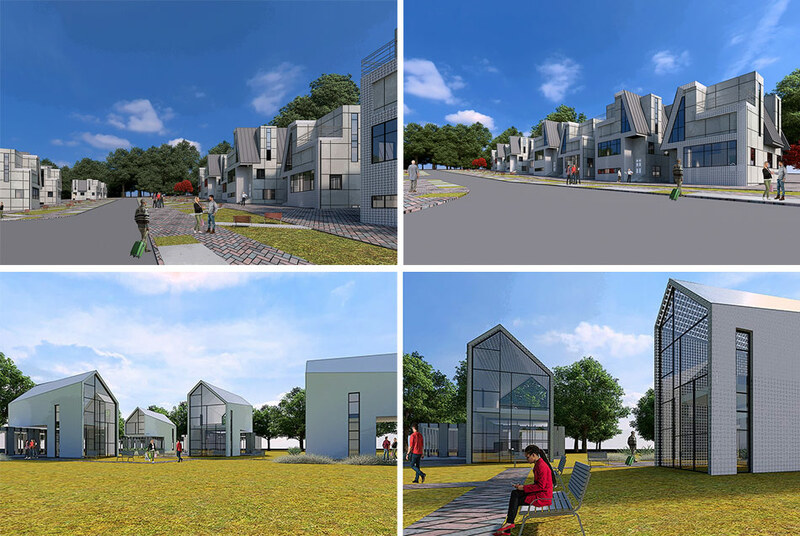 In Ft. Oglethorpe, GA, Francis Cauffman designed these detached, house-like units to give residents a community that is intended to be more like home. Bottom-up attention to individual experience can also reconfigure dedicated medical institutions. Long wait times in hospital emergency departments (EDs) are one indicator that medical needs and resources are often misaligned, and not solely because of the health insurance system’s inadequacies. Crispino described the patient mix at many institutions as a rough 80/20 rule, meaning 80 percent of challenging cases come from 20 percent of the patients. Decentralization of emergency services can help match the acuity of clinical conditions with appropriate facilities. Respiratory infections or minor injuries can be better suited to community-based walk-in urgent-care centers, bypassing private physician appointment delays or expensive care in EDs; ambulatory centers can occupy retail spaces under 5,000 square feet—the size of a “big Starbucks,” Crispino noted. Many older buildings in New York and other cities have floor-to-floor heights that readily accommodate imaging and surgical equipment, facilitating adaptive reuse in chains like CityMD or the branded branch clinics of major hospitals like NewYork–Presbyterian and NYU. A new typology, the freestanding ED, has arisen at two of the city’s former hospital sites, the North Shore/Long Island Jewish system’s Lenox Hill HealthPlex in the former St. Vincent’s and Montefiore Westchester Square, formerly the Bronx’s Westchester Square Medical Center. The ambulatory center for the Hotel Trades Council will include a health center with tech offices above. A new ambulatory center that Crispino and colleagues have designed in Brooklyn’s Cultural District for the Hotel Trades Council dispenses with waiting rooms entirely. 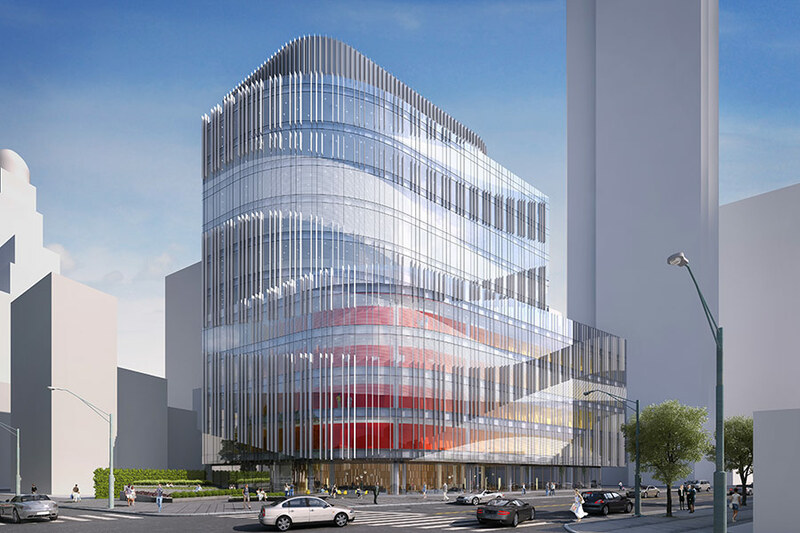 Opening in 2016, the 12-story, 165,000-square-foot HTC Brooklyn will be a mixed-use building with ground-level restaurants and retail, 65,000 square feet of medical facilities from the second through fifth floors, offices above, and a public park. Information technology obviates queuing: patients call in advance, check in at kiosks or by smartphone, and receive printed directions to examination rooms, aligned in staggered positions along corridors to make wayfinding signage visible at a distance with minimal supervision. In Fort Oglethorpe, Georgia (population 9,513 in 2013), Francis Cauffman is engaged in replacing an underused, over-scaled 500-bed hospital with a better-sized 100- to 120-bed facility, freeing up the 200-acre site for other uses, including a cinema, barbershop, bowling alley, parks, a few retail healthcare establishments, and about 1,500 residents in single and multifamily row houses. The senior-oriented plan calls for a pedestrian main street that links to the rest of Fort Oglethorpe and brings the elements of small-town life within a comfortable five-minute walk from any point for residents in their seventies. Replacing its scandal-ridden predecessor, Martin Luther King, Jr. Community Hospital in South Los Angeles brings dignity and health services back to the neighborhood. In a drastically different environment, South Los Angeles, the decline and resurrection of a major healthcare center is inseparable from a community’s fortunes. Martin Luther King, Jr. Hospital, a 461-bed facility opened in 1972 as a response to severe local needs highlighted by the 1965 Watts riots, grew so mismanaged and mishap-prone that neighbors called it “Killer King.” Patient deaths became national scandals, and MLK lost its Joint Commission certification and closed in 2007. The facility reopened this August as Martin Luther King, Jr. Community Hospital, just days before the 50th anniversary of the riots. 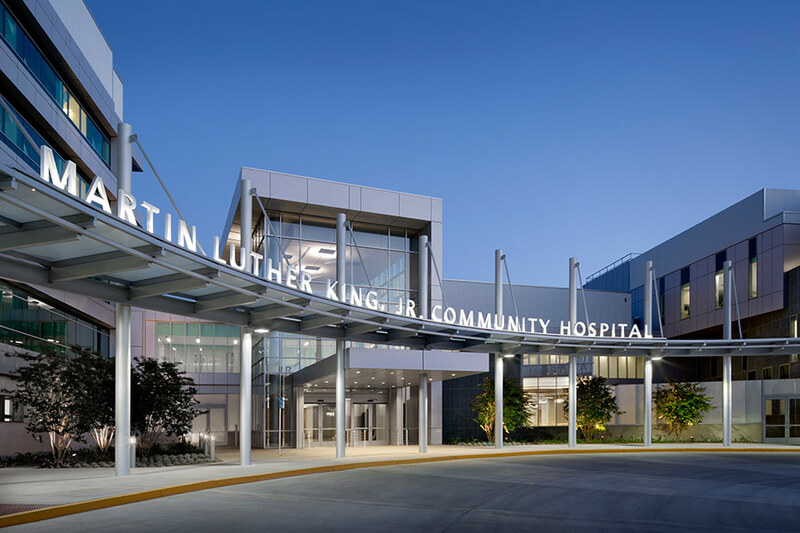 The reinvented MLK is “one of the first and most important steps in the reconfiguration of the Watts area,” said architect George Vangelatos, principal and healthcare practice leader of HMC Architects, designers of the renovated and “future-ready” hospital. Martin Luther King, Jr. Community Hospital in South Los Angeles. MLK’s lighting, landscaping, and other visible upgrades give patients an implicit message of respect. 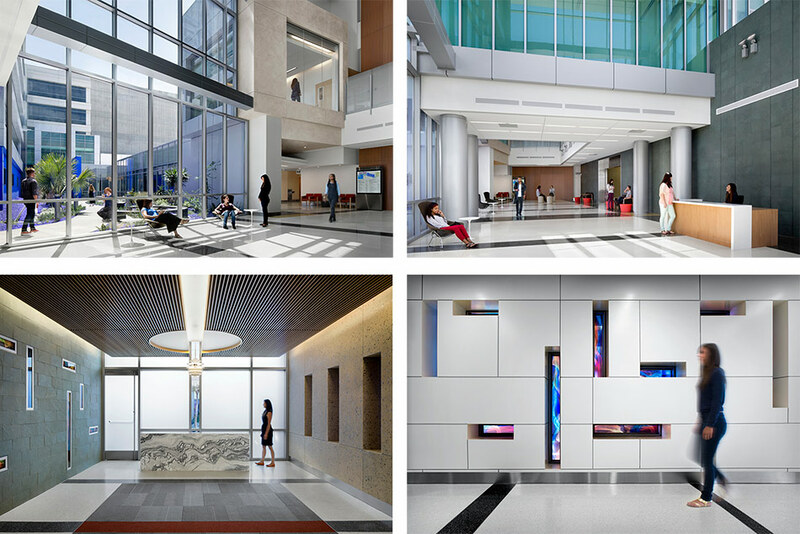 Upper floors, once dedicated to offices, were converted to well daylit patient areas, and the $1 million public art program, the largest funded by Los Angeles County, recognizes the relation between aesthetics and healing, a staple of evidence-based design. Yet the most consequential changes may be the features promoting operational flexibility in a fast-changing profession. “We have a fraction of the EDs we had twenty-five years ago in all of Southern California,” said Rose, citing local activist Sweet Alice Harris’ description of “kids with asthma needing to go twenty miles, and some of them not making it, [and] women giving birth in their house before the ambulance could arrive.” He suggested that the strain of using high-intensity facilities to provide primary care to starkly underserved communities is a reason EDs have been shutting down. “They are a huge financial drains on hospitals, sometimes dragging entire hospitals down with them,” he cautioned. Nationwide, numbers of inpatient beds are slowly dropping as specialty outpatients rise rapidly. “Statistics show that a patient stays in a bed for an average [of] three to three and a half days,” observed Steffensen, pointing out that the design also considers the wellbeing of the staff, who spend every day there. Triage and patient flow are pivotal: they direct 20–25 percent of patients to EDs and 70–80 percent elsewhere. Psychiatric conditions, he noted, account for significant proportions of cases initially believed to be acute somatic disorders, and Henning Larsen’s EDs thus include a common entrance for both types of patients. The Ten Degree House by Höweler + Yoon is designed to be accessible for aging-in-place clients. While Europe looks to a hospital as city model, what happens when home becomes hospital? Demographic trends favor the blurring of lines distinguishing fully independent living (an active “third age”), assisted living, and palliative care in nursing homes or hospice settings. Official estimates predict that by 2035 one in five Americans will be over 65, more than a third of UK residents will be over 60, and a quarter of China’s population will be over 60 (some 336 million people, more than the population of the U.S. today). Whatever medical advances lie ahead, they are unlikely to convince most of the elderly boomer generation that institutionalized life is widely desirable. 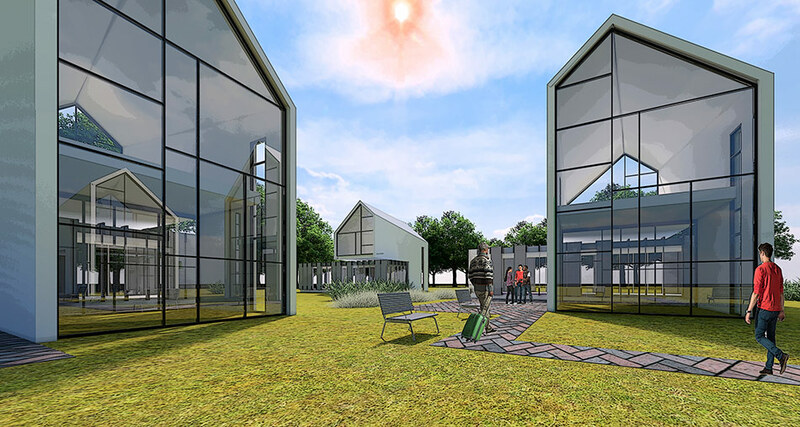 Naturally occurring retirement communities (NORCs), along with more intentionally engineered age-friendly spaces, offer certain bulwarks against the debilitating isolation of a senior facility. However, in many locations aging in place poses challenges, particularly when elders living in auto-dependent sites reach a point where driving becomes hazardous, or when dementing disorders make familiar spaces strange. The Ten Degree House by Höweler + Yoon. Cultures that emphasize filial care of elders may have valuable lessons for the age-phobic United States. Integrating built environments across generational lines can help people across broad spectra of ability and disability live in proximity with dignity and appropriate support. The Bridge House, located in McLean, Virginia, offers a strong example of design for multi-generational living. 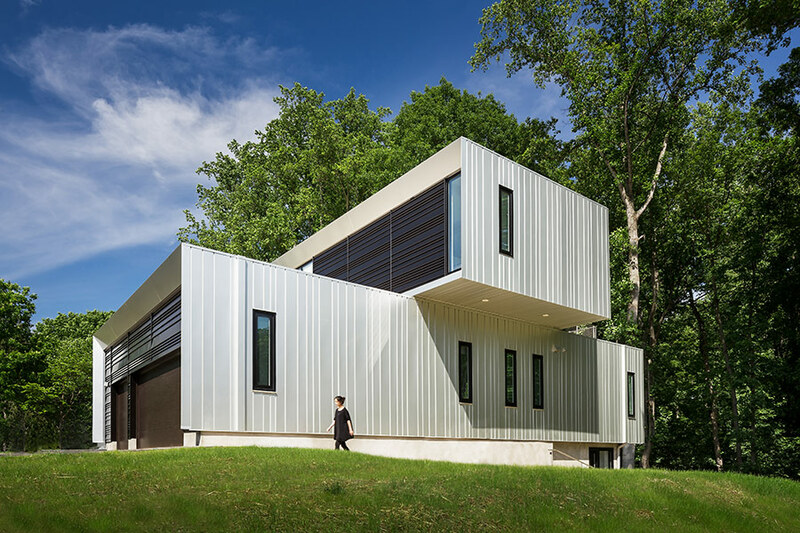 Designed by Höweler + Yoon and built in 2014, the residence appears as a single-family home when viewed from the front, while its rear elevation reveals three attached rectilinear volumes capable of housing three generations. Architect Eric Höweler describes Bridge House as a “post-nuclear-family house” and a potentially replicable model. The clients, first-generation Korean immigrants to the U.S. with adult children and grandchildren, occupy a suite in the smaller of two ground-floor volumes, minimizing use of stairs; the larger, more public volume holds shared programs: the kitchen, family room, dining room, and garage. An elongated upper volume cantilevers across the two ground-floor segments and houses the second and third generations along a single-loaded corridor, with master suites at each end, two central grandchildren’s rooms, and a rear roof terrace. Beneath the bridge, a central void with floor-to-ceiling glazing offers views into nearby woods, creating continuity between nature and domesticity while demarcating the first generation’s private zone. 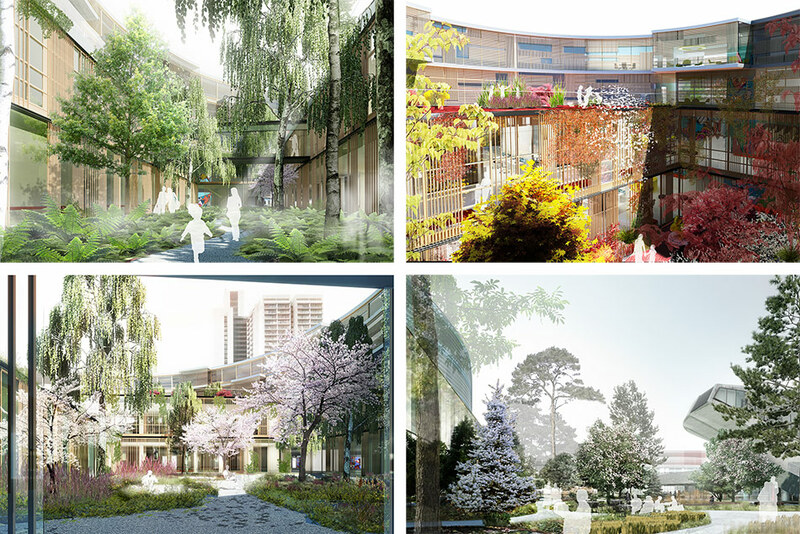 That gesture extends a strategy from another nearby Höweler + Yoon project for aging-in-place clients. 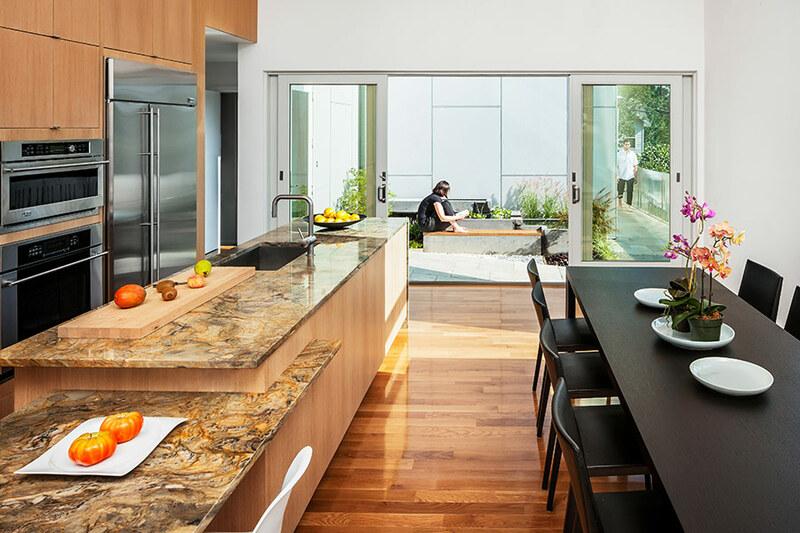 The 10 Degree House, designed for the parents of architect Meejin Yoon, places a small courtyard on the narrow site while still observing local zoning’s setback requirements. 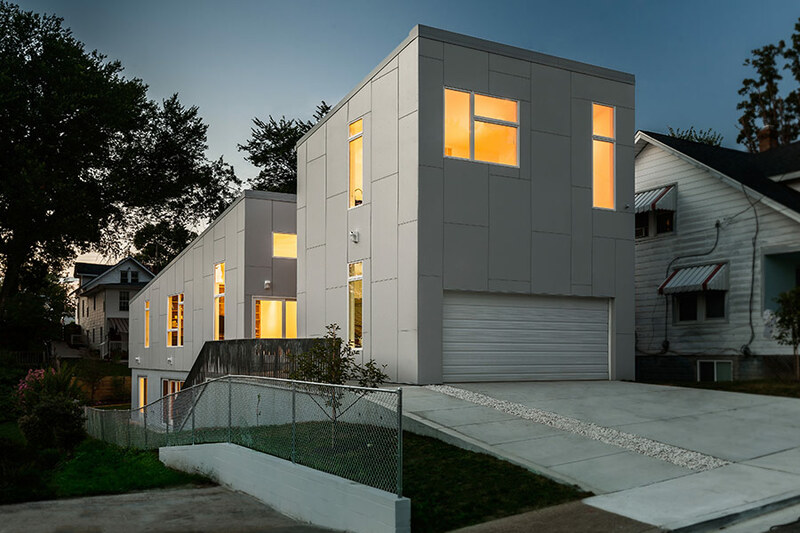 Clad in anodized aluminum panels, the facade treatment reflects the owners’ practical concerns. “They said, ‘We’re going to get old; we’re not going to have energy to get out there and paint the house, so we want a zero-maintenance cladding material,’” recalled Höweler. “You never have to paint it, you never have to stain it, you never have to worry about woodpeckers and other things.” Defying the upstairs-master-bedroom convention of normative American single-family houses, Höweler points out, eases access to essential spaces in the event of future disability. Barrier-free entry ramps and a wheelchair-accessible shower, he added, also make the 10 Degree House exemplary in this regard. Höweler + Yoon’s Bridge House is a “post-nuclear-family” dwelling that gives each generation its own private zones. Höweler + Yoon’s Bridge House. Bridge House essentially integrates three common domestic spaces geared toward seniors into a single building: the granny flat, mother-in-law apartment, and Hawaiian ohana unit. U.S. suburban zoning was commonly enacted for health and safety reasons and more nebulously to protect property values by limiting rental units. Interdependence between seniors, neighbors, children, and health providers is integral to active aging, yet zoning codes arguably express an impulse toward maximal separation of individuals and generations from each other—very twentieth-century, and a far cry from sustainable aging in place design. One suspects that as knowledge accumulates about how different designs affect health, and about how people would really prefer to live, that particular pendulum could swing in the opposite direction.